2018 Great Britain (UK) 1 Oz &###xC2;&###xA3;100 Gold Britannia Coin. 9999 Fine - Gem BU. Obverse The obverse showcases a portrait of Queen Elizabeth II designed by Royal Mint engraver, Jody Clark. This is the fifth portrait of Her Majesty to grace UK coinage during her long reign as a British monarch. 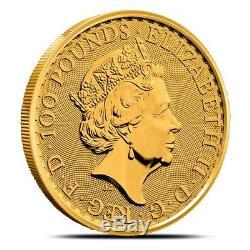 "ELIZABETH II" is inscribed, along with the coin&###xE2;&###x20AC;&###x2122;s denomination. Reverse Britannia, the female embodiment of Great Britain, stands tall on the reverse. She holds Poseidon&###xE2;&###x20AC;&###x2122;s trident in one hand and a shield and olive branch in the other. The name Britannia is based on Greek and Roman geographical terms. Inscriptions include "BRITANNIA" and the coin&###xE2;&###x20AC;&###x2122;s weight, purity, and year of issue. 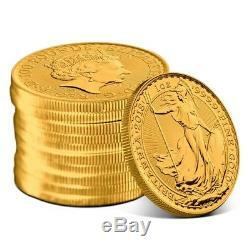 About the Gold Britannia The Gold Britannia has been annually released since 1987, and has since become highly sought after by investors and collectors around the globe. In recent years, the design was upgraded to include micro-engraved radial lines in the field of the reverse and a textured field on the obverse. This acts as both an authentication measure and a protection against visual damages like small scratches. At Provident, our primary goal is to make it simple and safe to invest in precious metals. We sell only genuine bullion products sourced directly from the mints that produce them, such as the US Mint, Royal Canadian Mint, Perth Mint, and more. In addition, our inventory holds a unique mix of products that you can only find at Provident. Additionally, our team is committed to offering exceptional customer service at every step of the investing process. You can rest easy knowing that you will get exactly what you ordered each and every time. All packages are fully insured during transit. Will I receive the exact item pictured? All photos are stock and are meant to represent the type and quality of item you will receive. Spot price is the market value of precious metals at a given point in time. Nearly all products in our store are priced at a premium or discount to the spot price. As spot price moves up and down throughout the day, so will the price of the product. How often are prices adjusted based on spot price? Similarly, our traders are NOT commissioned. What you see is what you get. Can I cancel my order? Cancellations are considered on a case-by-case basis. Is there a minimum order? There is no minimum order. Can I change my order once it has been placed? No changes can be made to the items included in an order once it has been placed, but a subsequent order can be placed. Yes, you can apply those monies at checkout. Will my order be insured? First off, we are sorry this happened. That said, it does happen, but we will make it right. We always do our best to do right by our customers. How long will my order take to get to me? This listing is currently undergoing maintenance, we apologise for any inconvenience caused. 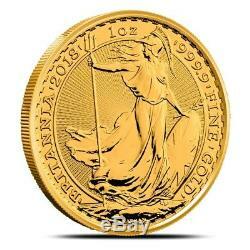 The item "2018 Great Britain (UK) 1 Oz £100 Gold Britannia Coin. 9999 Fine Gem BU" is in sale since Friday, April 27, 2018.